For Contact Checking during the hipot test, the 500VA Plus is equipped with a High Frequency Contact Check (HFCC) besides the Open Short Check (OSC) function. By conducting the Contact Check during Hipot test, it can increase the test reliability and efficiency significantly. For convenience, the 500VA Plus has a large LCD screen for operation. In addition, the GFI human protection circuit and Floating safety output prevents electrical hazard to the operator. For Motors: As industrial motors or EV motors are used for long hours and under varying environmental conditions suchas temperature and humidity, features like high durability andreliability are mostcritical.Temperature is also one of the key factors to influence insulation. If corona discharge occurs in turn-to-turn and turn-to-ground, it would cause the insulation to deteriorate due to the increase in heat andmaterial qualitative change. Adding Corona Discharge Detection in hipot testing exceeds the quality requirements for insulation by detecting units with poor insulation early thus reducing the defect rate caused by long-term usage. The image shows Corona Dischard in a motor. The dielectric withstanding voltage of components depends on materials and the manufacturing processes. For improving insulation in components, discharge levels should be defined including Corona discharge, Flashover and Breakdown. The Guardian 500VA Plus is equipped with a Discharge Level Analysis mode (DLA) for defining the programming voltage, time, counts and limits. It provides discharge analysis of three levels. 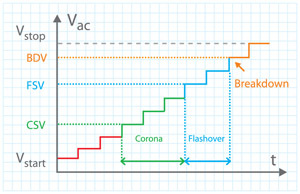 DLA mode will indicate the withstanding voltage depending on the different level limit beginning with Corona Discharge Start Voltage (CSV), Flashover Start Voltage (FSV), and Breakdown Voltage( BDV). R&D and QC personnel are able to improve insulation by discharge data collection and analysis.